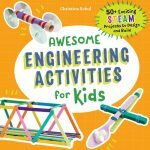 We’ve had quite a few snow days already this year… And when you’re snowed in, crafting is a great activity to keep kids occupied! This last snow day I pulled out the red and green craft sticks I bought a month or so ago. 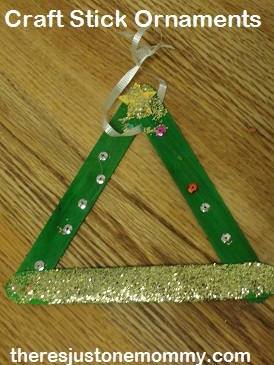 My daughter used a few to make a triangle, and inspired our next homemade Christmas ornament: craft stick ornaments. Cotton Balls, Glitter, Sequins, Stickers, Ribbon, etc. 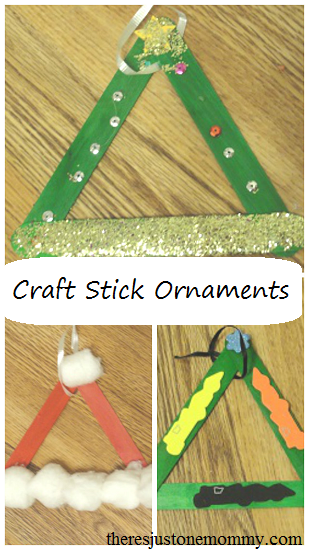 To create your own craft stick ornaments with the kids, first use hot glue to form triangles. 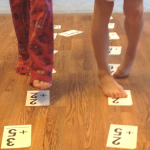 Then allow the kids to get creative! 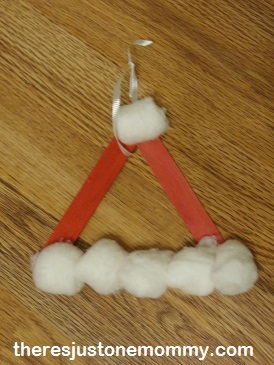 A triangle made with red craft sticks can become a Santa hat with the addition of a few cotton balls. Green craft sticks can become a Christmas tree with a few sequins and some glitter. When we crafted, I tried not to give too much input into what they could create. I really wanted their ornaments to be uniquely their own — and they were! The 4 year-old picked through all the craft supplies until he found some foam car stickers… He also got out the markers and drew our family on one ornament. Be sure to write your child’s name and the date on the back of the ornaments they create. It’s fun to look back through them over the years. 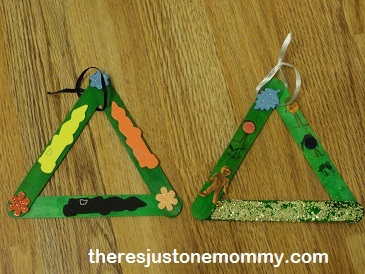 Looking for other homemade ornaments the kids can make? beaded Christmas ornaments — 4 different beaded ornaments kids can make. puzzle piece wreath ornament — Turn those puzzles with missing pieces into cute tree ornaments. sparkly pine cone ornaments — Every tree needs a pinecone ornament. 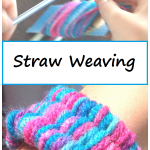 Another fun activity and so creative. I love the Santa hat. 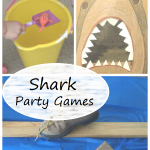 I love your crafts for kids..they are always so easy and so cute. I pray the Lord will bless you this Christmas season! Kids are getting so big! 🙂 Blessings! Thank you. And, yes, they are getting big! I’m actually in the middle of hunting through the hand-me-downs hoping to find longer pants for each of them. LOL. May you have a wonderful Christmas too! Oh good… another easy craft I can do with the kiddos in the coming days while they bounce off the walls waiting for Santa!!!! Thanks friend! LOL — Mine are bouncing off the walls as I type. Too much sugar and too much excitement over the big day coming! Another fantastic and simple idea for Christmas, so good to do with the kids when the weather is not so good for outside play! I am so glad that the image of your daughter was of pomegranate splatter! I thought she got some rash over Christmas! The worst! haha! Enjoy your blogging break! Thanks so much for stopping by the Critters And Crayons Facebook Page today- I am always glad to connect to with other bloggers! LOL — Yes, I guess it does look like a rash at first! Nope, that’s just my girl, doing things her way, even after I make a suggestion. Thanks so much for returning the stop — I really did love your sled/parenting metaphor!